Brazil, Peru and Colombia all have major holdings in Amazonia, and all have diverging policies that have had varying success in curbing deforestation. he Amazon rainforest spreads across nine of South America’s twelve countries. 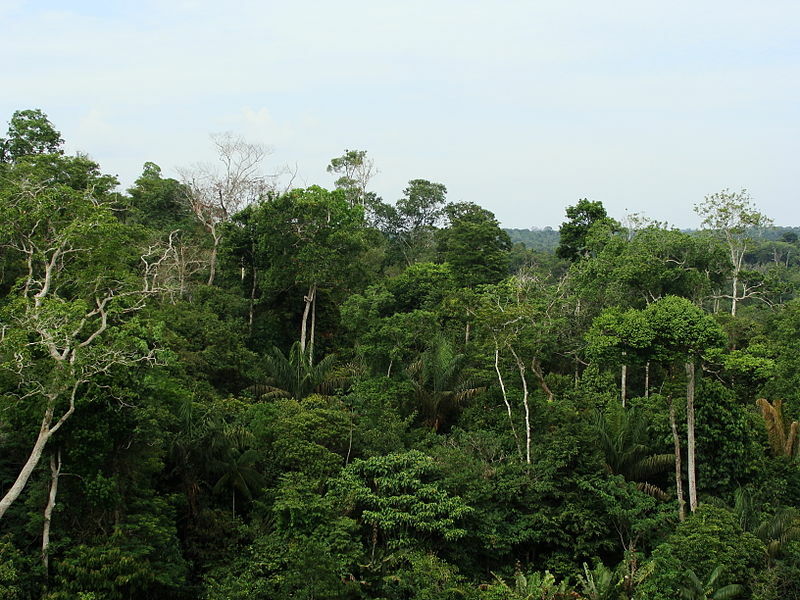 Those with the largest portions — Brazil, Colombia and Peru — each approach tropical forest conservation in a different way. But with a combined average of 3 million hectares (5,780 square miles) of forest cut down every year between 2001 and 2014 — an area more than twice the size of the U.S. state of Connecticut — it’s useful to compare these nations’ distinct strategies to find which ones are working, which ones aren’t, and why. The future forest health of Amazonia also depends on the region’s nations working together to limit deforestation. Brazil, with nearly two-thirds of the Amazon within its borders, is the “gorilla in the room,” says Meg Symington, Amazon Managing Director for the World Wide Fund for Nature (WWF). Global Forest Watch shows the Amazon Basin lost approximately 16.4 million hectares — nearly 4 percent — of its tree cover from 2001 through 2014. While large, relatively untouched areas of primary forest (Intact Forest Landscapes) still cover much of the region, significant degradation has occurred since 2000, particularly in the southern states of Rondônia, Mato Grosso, and Pará. The rate of deforestation there, driven primarily by cattle ranching and large-scale commercial agriculture, has been dropping steadily since 2004, from an average of 19,500 square kilometers (7,500 square miles) per year between 1995 and 2005 to only 5,843 square kilometers (2,255 square miles) in 2013. A study in the journal Science ascribes most of the reduction to land use restrictions and punitive threats including fines and jail. However, forest clearing in Brazil jumped by nearly two-thirds from 2013 to 2014. In Tocantins, Brazil’s newest state (created in 1988), deforestation for agriculture is surging, in part because the state environmental agency is using outdated, inaccurate maps to identify endangered fragmented forests. Tocantins’ forests shrank by 66 percent between 1977 and 2008. It’s fortunate, then, that Brazil has the best deforestation monitoring systems of any Amazon country, says Clinton Jenkins of the Institute for Ecological Research in São Paulo. “None of the other countries [in South America] has that,” he asserts. Both the government and Imazon, a national civil society organization, use satellite imagery to track forest cover, with high-resolution data going back to the early 1990s. The Deforestation Alert System (Sistema de Alerta de Desmatamento—SAD) monitors forest cover loss and forest degradation primarily in the Brazilian Amazon. The system generates information that is published monthly by Imazon, a Brazilian NGO. Global Forest Watch shows SAD recorded deforestation alerts affecting 1.4 million hectares and degradation alerts for 1.7 million hectares from January 2008 to July 2015, primarily in the country’s southern portion. However, changes in the country’s forest code in 2012 have conservationists worried. Among other provisions, the revision reduced the area to be reforested by over half, from 500,000 square kilometers (193,000 square miles) to 210,000 square kilometers (81,000 square miles), by granting amnesty to landowners who deforested illegally before 2008. One promising sign is that the Brazilian government has recently started cracking down on illegal deforestation in the Amazon, including the February 2015 arrest of the alleged ringleader of an illegal tree-cutting gang in the state of Pará. Anti-deforestation policies aimed at the country’s soy and beef industries have also seen some success; a 2006 law to limit forest clearing for soy production may have helped cause a significant reduction over a period of 12 years, according to an analysis in Science in January 2015. Peru manages the second-largest chunk of the Amazon region, and deforestation there is relatively low compared to other countries — totaling only about five percent of Amazonia’s forest loss since 1978. But as in Brazil, rates have risen sharply in recent years, with a spike of 275,000 hectares (1,000 square miles) cleared in 2012, a large increase compared to the 113,000 hectares (436 square miles) cut down annually on average since 2001. “Lack of governance is a big problem,” Jenkins says. “It’s not bad management or ill intent, just a lack of presence in Amazonian regions.” New roads, such as the recently completed Transoceanic Highway to Brazil, have encouraged an influx of settlers from the Andes into the country’s southern Amazon, where many become involved in illegal gold mining. “Peru has gone through enormous changes in terms of the quality of people involved in these issues,” Donovan says. “The government is getting serious about it for the first time ­— they were clearly wanting to be seen as [forestry] leaders at COP20,” referring to the United Nations Climate Change Conference held in Lima in 2014. As one of seven countries participating in Initiative 20×20 — a continent-wide effort to restore 20 million hectares (770,000 square miles) of land by 2020 — Peru pledged to restore 3.2 million hectares (123,550 square miles). “Now the question is whether they can deliver,” Donovan says. Also in 2014, Norway pledged $300 million to help Peru become carbon neutral in terms of its deforestation by 2021. New laws aimed at promoting foreign investment could severely undermine Peru’s current environmental standards, warns Julia Urrunaga, Director of Peru Programs for the Environmental Investigation Agency. Law 30320, passed in 2014, sharply reduces the Environment Ministry’s role and limits fines for environmental violations. An analysis by Colectivo Territorios Seguros del Peru, a rural property ownership partnership, also found the law will overturn land rights guaranteed to indigenous groups and rural communities. “These new laws are just destroying everything Peru has struggled to put in place,” Urrunaga says. In 2011, Peru announced a plan to build at least 20 huge hydroelectric dams on the 1,700-kilometer (1,056-mile) Marañón River. The free-flowing river is the main source of the Amazon. A 2014 report by the NGO International Rivers reported that the project — which could include as many as 40 dams over the entire river basin — would flood about 7,000 square kilometers (2,700 square miles) of forest and force thousands of people to relocate. One dam, already under construction, is slated to begin operation in December 2016. “Colombia is a complex story,” says Bronson Griscom, Director of Forest Carbon Science at TNC. The decades-long armed conflict between government forces and terrorist and criminal groups is winding down, freeing up resources and attention for conservation. At the same time, according to a forthcoming paper in Biodiversidad Amazonica, the insurgency also hindered extractive activities in the Colombian Amazon, so the end of hostilities will test the country’s commitment to creating and conserving protected areas. The Colombian Amazon. Photo by Actorsuarez licensed under the Creative Commons Attribution-Share Alike 3.0 Unported license. Recent years have brought encouraging news, including the 2013 expansion of Chiribiquete National Park, the largest in the country, from 12,990 square kilometers (5,000 square miles) to 27,800 square kilometers (10,700 square miles). Deforestation in 2013 was 138,750 hectares (536 square miles) according to Global Forest Watch (GFW), or 120,933 hectares (466 square miles) according to Colombia’s first annual deforestation report, released in 2014. No matter which source you use, this represents a significant drop from the annual average of 208,000 hectares (800 square miles) of tree cover lost between 2001 and 2012, as tabulated by GFW. Over half of this deforestation occurs in the Amazon. Colombia joined the Global 20-20 Initiative in 2014, with a goal of restoring 20 million hectares (77,220 square miles) of forest by 2020. A new monitoring system should make progress (or lack thereof) easier to track. Last year the country also declared plans to create a new protected area, the Estrella Fluvial de Inirida, on the Venezuelan border, encompassing the headwaters of the Orinoco River, one of the largest on the continent. This would essentially ban mining over 253,000 hectares (975 square miles). Colombia still has enormous development challenges, says Donovan. Cattle ranching is one of the main drivers of deforestation, which is why The Nature Conservancy, the World Bank and other partners helped set up a sustainable cattle ranching project in 2010. “The goal is to stop the expansion of the agricultural frontier,” says Adriana Soto, Nasca Director for The Nature Conservancy. The project promotes the adoption of environmentally-friendly silvo-pastoral production systems, which incorporate healthy forestry practices into grazing management decisions. By the time the program finishes in 2018, some 2,700 farms across 63,000 hectares (243 square miles) are planned to participate. As diverse as their individual conservation strategies are, Amazon countries are also working toward joint initiatives, as well as conservation strategies that build on each other’s successes, says Symington. Peru’s recent National Pact for Legal Wood, which aims to have all wood for domestic or international sales verified as to legal origin by 2021, was modeled on similar agreements in Colombia and Brazil. WWF helped Brazil set up the Project Finance for Permanence (PFP), an innovative funding approach that has raised $215 million from donors for the long-term creation, consolidation and maintenance of the country’s protected areas. The fund is planned to eventually cover 62 million hectares (240,000 square miles), an area almost twice as large as all U.S. national parks combined, including 15 percent of the Brazilian Amazon. “That was a huge success,” Symington says, adding that WWF is currently negotiating a similar arrangement with the Peruvian government. The idea of joint initiatives goes back at least to 1983 and the creation of Red Parques, which brings together the heads of each South American country’s national park service in a continent-wide network. “It’s a great precedent on a regional level for joint protection of protected areas,” Symington notes. At the U.N. Convention on Biological Diversity in Nagoya, Japan in 2010, South American countries with Amazonian territory signed an agreement to work to develop national systems that were regionally complimentary. The nations of the region “are realizing the Amazon is an ecosystem in itself, and the importance of interconnectedness,” Symington concludes. Gibbs H.K. et al. (2015). Brazil’s Soy Moratorium. Science 347: 6220. Nepstad D. et al (2014). Slowing Amazon deforestation through public policy and interventions in beef and soy supply chains. Science 344: 6188. Tollefson J. (2011). Changes to legislation could undermine authorities’ power to halt deforestation. Nature 476: 259-260.